The Indian film industry's top award show has sailed into Tampa, Florida with a pirate-themed opening musical number and celebrities ranging from Slumdog Millionaire star Anil Kapoor to John Travolta and Kevin Spacey. Before a crowd of some 20,000, the International Indian Film Academy awards started with the entrance of actors aboard a float built like a pirate ship - a nod to Tampa's love of pirate-themed parties. The show informally known as the "Bollywood Oscars" are being held in the US for the first time. Co-hosts Shahid Kapoor and Farhan Akhtar, dressed in swashbuckling outfits, demanded the key to Tampa from Mayor Bob Buckhorn, who was sitting in the front row at the city's NFL stadium. "I will give you this key if and only if you entertain us," said Mayor Buckhorn, after which Kapoor and Akhtar climbed onstage and proceeded to have a mock sword fight. But it was Travolta that made the crowd come to life. 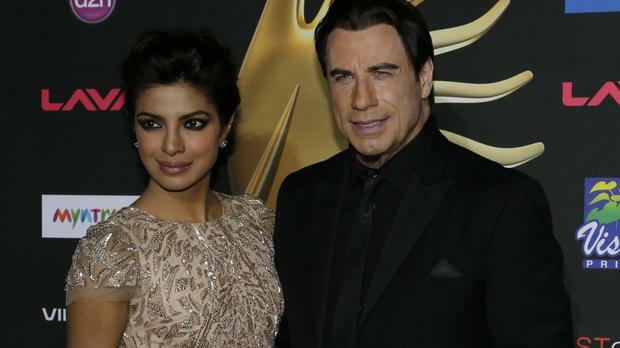 Indian star Priyanka Chopra pulled him onstage and Travolta did some signature moves from his 1994 blockbuster film Pulp Fiction. Later, actor Hrithik Roshan presented Travolta with an award for Outstanding Achievement in International Cinema, declaring the two-time Golden Globe winner "the coolest of them all". "I'm honoured. I'm humbled," Travolta said. Padukone and the co-hosts persuaded Spacey to don a Lungi - a sarong - and dance to a wildly popular song called the Lungi Dance, which was written for the movie Chennai Express. Before the show started, Travolta, Spacey and dozens of Indian film stars walked slowly past hordes of international media outside the stadium. Unlike the Academy Awards, IIFA uses a green carpet instead of a red one. Like a Bollywood movie, the awards show was long, colourful and filled with spectacular song-and-dance numbers. The opening musical sequence combined elements of pirates, underwater creatures and cheerleaders. Other songs were medleys of movie hits, with Cirque du Soleil-type acrobatics. Some of India's hottest movie stars received awards during the ceremony. While many were similar to Oscar-style accolades (best actor, best picture), others took a different twist (best villain, best performance in a comic role). Bhaag Milkha Bhaag, a film about the life of Indian track and field Olympian Milkha Singh, was the big winner of the night. The 84-year-old Singh was in the audience. The movie won the best story award, best director and best picture. It also won nine technical awards during a separate ceremony in Tampa on April 25. Farhan Akhtar (the co-host) won best male lead actor for his starring role in Bhaag Milkha Bhaag, and Deepika Padukone won best female lead actor for her role in Chennai Express.